Are you tired of your straight hair and want to curl them for different hairstyles? Keeping a good hair curler in your hair styling kit can prove to be very useful as you can create so many types of different and stylish hairstyles with curls. Hair curlers are very easy to use and help you get envious curls at home in just a matter of minutes. If you are looking for a curler than creates medium curls, you should go for this automatic curler from Kiss Products. It is made with ceramic ionic technology and has the upper temperature limit of 420 degree Fahrenheit. The width of the curling wand is 1 inch and it has ridges at the base for detangling the hair while curling. The wand is designed in such a way that it curls in both left and right directions. The curler comes with two heat settings and has an auto shut-off feature that switches off the curler after 90 minutes automatically. The price of the curler is high but you can get it at a discount online. The curler comes with two heat settings and the ceramic ion technology heats it evenly. The width of the curler wand is perfect for creating all types of curls. The toggle switch allows the user to create curls in both right and left direction. Auto shut-off feature prevents accidental burning and damage to the curler. The price of the curler wand is high as compared to its features. The wand does not work well on very fine and silky hair. The width of this curler is such that it works well on all lengths of hair and creates tight to medium curls in both directions. It is also quite lightweight and handy for travelling purposes. With two sizes and three colour options to choose from, the Conair curl secret curler by Infinity Pro is designed for frizzy and dull hair. It uses tourmaline ceramic technology and reduces frizz if used correctly. The design of the curler is such that it creates great curls in just a few seconds and is suitable for all hair types and lengths. You can create very tight to very loose curls easily using the two heat settings. The highest heat setting on the curler is 400 degree Fahrenheit and is especially good for beginners since it curls the hair perfectly if you section them. The price of the curler is very high but the quality and the design make it worth it. The design of the curler does not burn the hands and is foolproof for beginners. The three colour options look stylish and you can choose from two variants. It is suitable for all types of hair and can create tight to loose curls. Tourmaline ceramic technology distributes heat evenly and is gentle on the hair. It requires proper sectioning of the hair before you can curl them and is a bit heavy. The price of the curler is very high and hair can get stuck in the curling drum. This is a great curler for beginners who do not know how to position the hair correctly on the wand. It takes hair inside the curling drum itself if sectioned properly and creates beautiful curls in just a few seconds. If you are looking for an affordable curling wand, this model from Remington is a good product to consider. It is available in two width options of ½ inch to 1 inch and 1 inch to 1.5 inches. The width of the barrel is good for creating loose wavy curls. The curler is made using the pearl ceramic technology that makes the hair look soft and smooth. It comes with a heat protectant glove for additional protection against the hot barrel. The highest heat setting of the curler is 410 degree Fahrenheit and it has a 60 minutes auto shut-off feature. The price of the curler is quite affordable. The wand heats up quickly and promotes even heat distribution. The two size options make it easier to buy a curler according to your hair length. The auto shut-off feature of 60 minutes and heat protectant glove provide additional safety. The price of the curler is very affordable as compared to other brands. The barrel does not have a clamp to keep the hair in place for curling. The length and width of the curler do not work for short or very fine hair. This curling wand is quite affordable and has many great features like digital controls and additional safety features. The two width options and the ease of use make it a great tool to have in your hair styling kit. 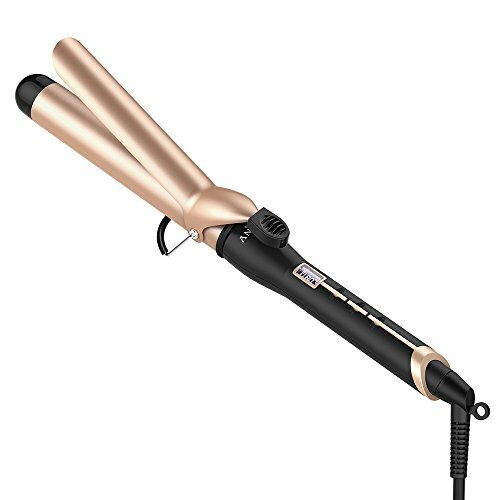 Chi is one of the most popular hair styling brands in the luxury department and this curling iron from Chi is used in many salons. 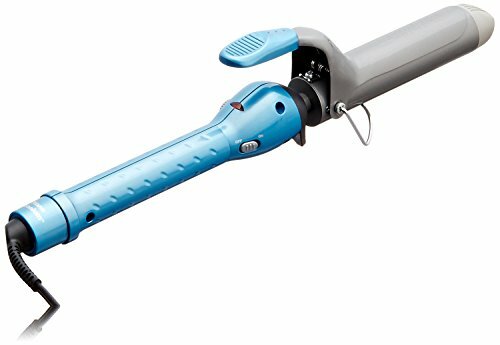 It comes with an automatic rotating barrel that helps you curl your hair easily within seconds. The width of the barrel is 1 inch and it is suitable for medium to long hair. The digital controls on the model with a timer are quite useful in preventing accidental burns. It creates long-lasting curls for all types of hair and is known for its quick results. The price of the curling wand is very high and it is one of the most expensive curling wands available in the market. The automatic rotating barrel makes it quick and easy to curl any length of hair. The ceramic barrel heats evenly and is gentle on the hair. The digital temperature controls and the timer help in temperature regulation. It is quite lightweight and is suitable for long to medium hair. The curler is quite expensive as it is a luxury hair styling tool. The automatic rotating barrel takes some time to be accustomed to. This curling wand might seem expensive but it is very convenient to work with and creates long-lasting curls that hold shape for days. The sleek design and the advanced digital controls make this curler worth the high price. With nine sizes to choose from, this curler from TIGI Bedhead range is another affordable option for beginners. It has a spiral barrel of 1 inch width and is suitable for creating very tight curls. A heat protectant glove is included with the curling wand and the highest heat setting is 400 degree Fahrenheit. The 6 feet cord swivels easily in all directions and does not tangle. The curler has a cool tip also which makes it easier to hold it while curling. It reduces frizz and makes the hair look shiny and healthy. The price is affordable and you can even get some additional discount online. The spiral design of the wand creates tight bouncy curls that have a salon-finish. The price of the curler is affordable as compared to its quality. The additional heat glove and cool tip prevent burns. It comes with a 360-degree swivel cord of 6 feet which makes it more convenient to use the curler. The curler might not be suitable for people looking for loose curls. It curls created with this curler do not hold their shape for long. This curler is great for creating tight curls and can be used for short to medium hair. It comes at an affordable price and as many safety features that protect the hair and the skin while curling. When it comes to luxury hair styling, GHD is a very popular brand and is even used by celebrities. This curler comes with a tapered barrel of width 0.9 inches and can be used to create natural beachy waves. The barrel has three zones that come with sensors to detecting the temperature distribution. It is coated with ceramic and reaches a temperature of up to 365 degree Fahrenheit. A glove is also included with the curler to protect the skin. The price of this curler is higher than other curlers on this list but the brand is known for its luxury hair styling tools. The tapered round barrel creates natural curls that last for a long time. The sensors fitted in the barrel regular temperature distribution effectively. It is suitable for all lengths of hair and can also be used on fine or damaged hair. The quality of the hair curler is very good and it is travel-friendly as well. The price of this curler falls in the luxury segment. It cannot be used for creating tight curls. This curler from GHD might be very expensive but it is used in many salons for its professional finish and long-lasting results. It creates natural curls and distributes heat evenly across the barrel. A popular hair styling tool from the house of Revlon, this ball wand has a unique shape and is available in two sizes. The barrel is ball-shaped and is suitable for creating medium to loose curls. The curler comes with a cool tip and a heat protectant glove also. It reaches a temperature of up to 420 degree Fahrenheit and comes with heat settings to regulate the temperature. It takes some time to warm up evenly but creates long-lasting curls quickly without causing any hair damage. The price of the curler is very affordable and it works for all types of hair. The ball-shaped barrel creates curls quickly and gives the hair a professional look. The wand heats up to 420 degree Fahrenheit and comes with multiple heat settings. It comes with a glove and has a cool tip for ease of use. The price of the curling wand is quite affordable as compared to other models. The barrel takes some time to heat evenly and create long-lasting curls. It is not very sturdy in terms of design and can break if dropped frequently. This is a very affordable hair curler which is good in terms of performance and creates curls that last longer. The unique ball-shaped barrel helps to create natural wavy curls. One of the very few hair curlers that come with a clamp, this model from Hot tools is available in ten different sizes and has an extra-long barrel for long hair. The cord of the curler is of 8 feet length. The size of the barrel is 1 inch to 1.25 inch and it is plated with 24-karat gold which is a great conductor of heat. The clamp holds the curls in place and defines them very efficiently. It is a little bulky for travel purposes but works well for home use. The price is also reasonable as compared to its quality. The clamp design makes it easier to curl the hair in the shape you like. It comes in ten different size options for different hair lengths. The gold-plated barrel conducts heat evenly and prevents hair damage. The price of the curler is reasonable and the quality is good for the price. The curler takes some time to curl the hair evenly if you have long hair. It does not have an auto shut-off feature to prevent accidents. Hot Tools is a very popular brand for hair styling tools and this curler is great in terms of quality and design. It works effectively and is very convenient to use because of the long cord length and the gold plated clamp design. Another affordable option to consider, the Anjou curling iron is suitable for creating all types of curls for all hair lengths. It has a 1.25-inch barrel of length 8.27 inches with a 360-degree swivel cord of length 2.5 meters. The curler is available in three sizes and two colour options to choose from. It has a temperature range of 200 to 410 degree Fahrenheit and heats up quickly in just a few seconds. Another unique feature of this curler is that it comes with a stainless steel support to rest the hot curler on after usage. The price of the model is affordable. The size of the barrel suits medium to long hair and creates defined curls. The stainless steel support prevents burns and helps in cooling down the barrel easily. The color options and the size range make it suitable for all hair types. It comes with a long cord with 360-degree swivel feature. You need to wear a glove while curling the hair to prevent accidental burns. The curls created with this curler do not hold their shape for long hours. The barrel length of this curler and the long cord work make it easy to create curls with this curler. It is suitable for all hair lengths and the temperature range is easy to control as well. With 50 heat settings, this titanium curler from BaBylissPro is a bestseller from the brand. It is available in four sizes and has a nano-titanium coating on the barrel for even heat distribution. It is a spring curling iron that has a barrel size of 1.25 inches and creates loose curls. The curler also comes with a turbo heat button that can be used to heat the barrel quickly in case of time constraints. The curls created with this curler last long and hold their shape easily. The soft silicone grip makes it convenient to hold the curler. The price of the curler is moderate. The nano-titanium ceramic barrel uses infrared technology to distribute heat. The curler comes with 50 heat settings and reaches a temperature of up to 450 degree Fahrenheit. There are four size options to choose from and the barrel size is good for creating all types of curls. The turbo heat button boosts heat across the barrel for creating quick curls. The curler can heat very quickly and burn the hair if not used carefully. It takes some time to create long-lasting curls that hold their shape. This curler comes with multiple heat settings and is quite easy to use for all lengths of hair. It has a very robust design and is priced well as compared to its features and design. You need to choose a curler that is designed for your hair type and hair length. Curlers that have a long barrel might not be suitable for short hair and vice versa. If you have damaged hair, avoid buying a model that reaches high temperatures quickly and can burn the hair. There are many size options available in the market when it comes to hair curlers. Barrels of width ranging from 0.5 inch to 2.5 inches are designed to suit different curl preferences and hair lengths. Choose a barrel size that suits your hair length and creates the type of curls you want. You can get a good hair curler in the price range of 30$ to 150$ but avoid buying very cheap hair curlers which can not only burn your fingers but can damage your hair as well with uneven heat distribution. Look online for discounts and invest in a well-known reputable brand only. Reading the customer reviews of a product that you are considering will help you understand all the features of the product before you make your decision. It will also give you an idea of how the product works and what are its advantages. Look for features like auto shut-off mode, extra heat protectant glove, and swivel cord in a product. These features can make it more convenient for the user and add to the functionality of the product. So this was our detailed guide on the ten best hair curlers available in the market. You can use this buyer guide to select the right product after considering all the parameters like hair type, curler size, and more. Hair curler tools can play a huge role in your vanity and can help you create professional hairstyles within the comforts of your home so it is important to invest in the right product. Have you used a hair curler? How was your experience? Is it possible to style hair after permanent straightening with curler? Sure you can. I suggest you to use a heat protectant spray as well. In fact, there is no “permanent straightening” but only straightened until getting new growth. Whenever you have a chemical straightening treatment, just do nothing to your hair at least 14 days and do not curl. I wonder if I can use curler on a plastic haired wig? I recommend you just say no to curl a cheap wig $20-$50 with curler. It’d better if you use a curler to the wigs $40-$75 with heat resistant but low heat setting is needed. I prefer GHD Creative Curl Wand. It works very well. CHI ARC 1″ Curling Iron is my best choice. It make my hair curled in a good shape.